“Topped with a swirl of the citrus-mint pesto, this soup has bright flavors and a silky-smooth texture,” Viviane Bauquet Farre of food & style says of the soup she created. It’s also healthy. Winter squash – which Viviane calls “the kings of winter vegetables” – are an important food source of carotenoids, a key antioxidant. Antioxidants can help protect healthy cells from damage caused by so-called “free radicals” in the body. This soup recipe starts with a white wine reduction, which creates some “wonderful natural sweetness but also brings a bit of tang,” Viviane notes. 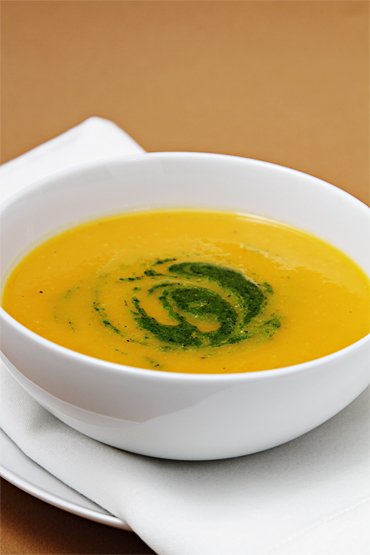 Squash chunks – butternut squash, kabocha, sugar pumpkin – are added, along with vegetable broth and water. Our fruity Arbequina oil, meanwhile, would be great for making the citrus-mint pesto, which includes parsley, mint, fennel seeds, orange zest, and pine nuts. The soup can be made three days ahead of time and reheated before serving. It also freezes well for up to a month.